Ibram Kendi (right) addresses the audience as Washington Post reporter Wesley Lowery, who was the presenter for the event, stands by. 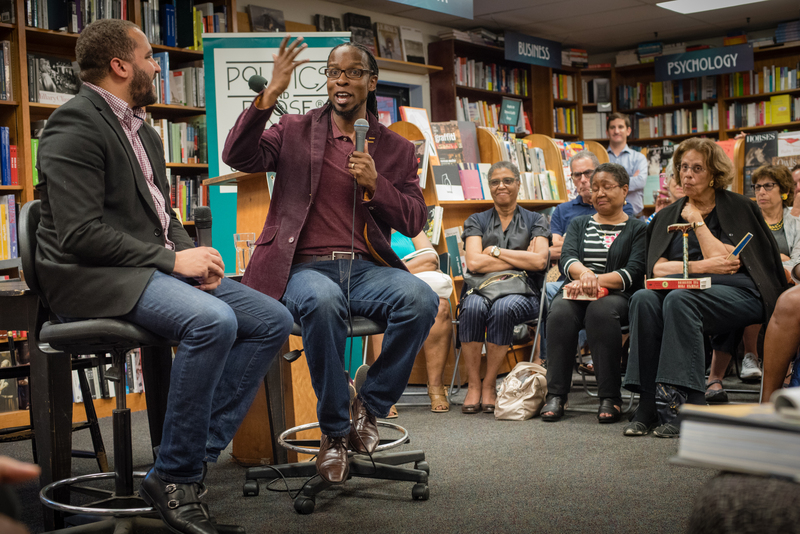 A diverse group made up a standing-room-only audience during Ibram Kendi’s recent book promotion event at Politics and Prose. 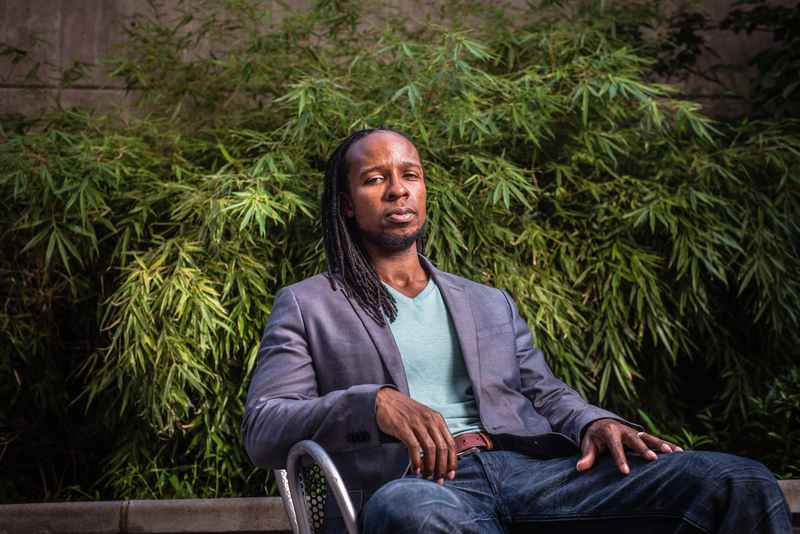 With the breadth of his scholarship and expanse of his reach, Kendi has been compared to the famed late historian John Hope Franklin, except he wears his locs long and his edges laid. He used to fantasize about a career in the NBA — or, at the very least, on SportsCenter. He’ll hit you back on Twitter. Just so you know, black people are not inherently better athletes than white people, Kendi says. We only think so because “black people have not only been rendered inferior to white people, they’ve been rendered like animals,” and thus physically superior creatures. It’s an old racist idea that helped justify African-Americans’ suitability for backbreaking labor and medical experiments and the theft of their children. “When we embrace this as part of our identity,” Kendi says, “we don’t understand.” He wants to correct our misunderstandings. Education, love and exemplary black people will not deliver America from racism, Kendi says. Racist ideas grow out of discriminatory policies, he argues, not the other way around. And if his new center can help identify and dismantle those policies in the U.S. and around the world, he believes we can start to eliminate racism. At least that’s the goal. As the evening wears on in the crowded bookstore, people line up at microphones to question, challenge or offer up hosannas to this young scholar, who, in many ways, is just getting started. 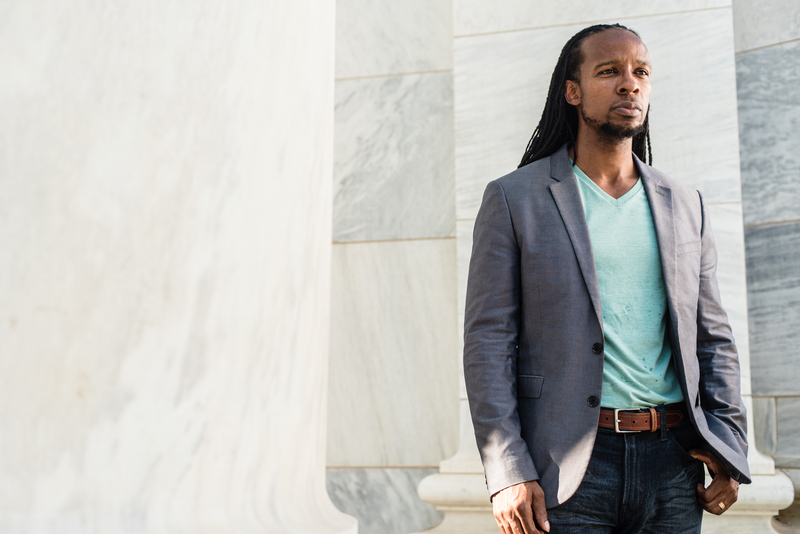 Ibram Kendi is the new founding director of The Anti-Racist and Policy Center at American University. He is a leading thinker on race and his 2016 book, Stamped from the Beginning: The Definitive History of Racist Ideas in America won the National Book Award. Kendi apologizes for the spare office space he shares with a colleague inside American University’s School of International Service. The walls are bare, and his name has not yet made it outside the door. He’s still unpacking from the move to D.C. with his wife, Sadiqa, a pediatric emergency room physician at Children’s National Health Center, and their 1-year-old daughter, Imani. It’s an ambitiously busy life. Besides being the founding director of the research center, he’s teaching history and international relations as part of a joint appointment that brought him from the University of Florida, where he was a professor of African-American history. He’s learning the city, and working on priorities for the center — part think tank, policy shop and incubator for anti-racism strategies — which formally launches next fall. It joins dozens of other customized centers of racial research. One of the earliest and most notable, the W.E.B Du Bois Research Institute at Harvard University, rose to prominence under the leadership of Henry Louis Gates Jr. This year, “year zero,” is to raise funds and recruit researchers, faculty and students. The goal is to identify inequalities, identify the policies that create and maintain those inequalities, and propose correctives in six areas: criminal justice, education, economics, health, environment and politics. Kendi also hopes to create an online library of anti-racist thinking. He’s still considering initial projects. But when he talks about racism, he is not still puzzling out his ideas. Kendi has spent thousands of hours reading thousands of documents, including “some of the most horrific things that have ever been said about black people,” to uncover the origins of racist thought. His words are distilled, precise, authoritative. His voice never rises. He is, temperamentally, an antidote to the heat of the subject matter and the hyperbole of the times. “We have been taught that ignorance and hate lead to racist ideas, lead to racist policies,” Kendi said. “If the fundamental problem is ignorance and hate, then your solutions are going to be focused on education, and love and persuasion. But of course [Stamped from the Beginning] shows that the actual foundation of racism is not ignorance and hate, but self-interest, particularly economic and political and cultural.” Self-interest drives racist policies that benefit that self-interest. When the policies are challenged because they produce inequalities, racist ideas spring up to justify those policies. Hate flows freely from there. This is the jump-off Kendi uses to frame the most roiling issues of the day. But before he could build that frame, he first had to deal with his own racism. Kendi was born Ibram H. Rogers in Jamaica, Queens, New York, to parents who’d been student activists and were inspired by black liberation theology. He grew up playing basketball and still is an ardent New York Knicks fan. The family moved to Manassas, Virginia, where Kendi attended Stonewall Jackson High School (named for the Confederate general) and dreamed of a career on the hardwood. The slim, 6-foot-1 former guard says he specialized in the no-look pass. “I consider the beautiful pass the most beautiful part of the game of basketball,” he says. Sweet passing aside, his basketball aspirations were irrevocably dashed his sophomore year when he failed to make the junior varsity team. “I was so crushed,” Kendi says. He studied journalism at Florida A&M University and initially wanted to be a broadcaster or a sportswriter. But after internships at The Mobile Register and The Atlanta Journal Constitution, he began to shift his career focus. He wound up getting a doctorate in African-American studies from Temple University. His first book, on the black student protest movement in the ’60s and ’70s, was published in 2012. He began researching Stamped from the Beginning the following year. Another racist idea: “I believed that black children were achieving at a lower level than white children. And I believed in the existence of an achievement gap,” says Kendi. Standardized tests prioritize reading and writing as measures of verbal proficiency, as opposed to the wider ability to articulate. And they test subject areas where black schools are vastly underresourced. “I certainly am somebody who advocates equalizing the resources of school and creating a situation in which we actually live up to our pronouncements that we live in a meritorious society,” says Kendi. “But even if these schools persist in being resourced unequally, that doesn’t necessarily mean that the students in the schools with lesser resources are intellectually inferior to the students with better resources.” He reaches into history to illustrate his point: Just because slaves’ lives were circumscribed, they faced more adversity and they dealt with more violence, that doesn’t mean enslaved people were inferior to people who were free. A “more lighthearted area” he had to confront was his ideas about dating black women. “Black women were angry, they didn’t know what they want, they’re difficult,” he’d heard. “And from my standpoint, those are some of the things that I said when I was having some difficulties in dating.” When we have negative experiences with individuals, “we often say there’s a problem with that black group,” without realizing those are racist ideas. Now, he’s a poster child for black love. He and his telegenic wife met on Match.com and debuted their new last name Kendi (“loved one” in the Kenyan language of Meru) at their 2013 wedding in Jamaica, which was featured in Essence magazine. With regard to the most front-and-center issue in sports today, athletes and activism, Kendi says it’s important to remember that the athlete/activists of the 1960s — Muhammad Ali, Jim Brown and Tommie Smith — all spoke out in the context of the Black Power movement, which is “precisely what’s happening now” with Colin Kaepernick and others who were inspired by Black Lives Matter. “We look for athletes to generate movements, when historically athletes have been good at being athletes, which is precisely what they should be good at, and we should be looking to activists to generate movements.” There will then be those athletes who use their platforms to support those movements and ideologies. Kendi says that while the numbers of black players on the fields, courts and arenas have increased dramatically over the past 50 years, it’s been harder to make shifts at other positions. This kind of analysis gives Kendi cachet beyond the ivory tower and makes him popular with students, Neal said. Young people see Kendi with his locs and his ability to communicate in a vernacular they know and that expands their thinking about the possibilities for their own lives. They’ll say, “This is somebody I can imagine being somewhere down the line,” said Neal. Peter Starr, dean of the College of Arts and Sciences at American University and one of those responsible for bringing Kendi to the university, cites Washington as an organic place to do anti-racist work. “To make real lasting change, change that lasts beyond changes of administrations and flips from one party to the next, you really need to reach out to people who are making more fundamental policy on the ground, in the agencies and throughout the government,” he said. Starr calls Kendi’s vision to use researchers from around the country an approach that mirrors what happens in the sciences. “He’s got a very expansive vision of the center, and we really think this is a center that’s not just the usual, relatively small, one-person shop,” he said. He calls Stamped from the Beginning the kind of book scholars write in their 50s and 60s. But Kendi’s impact will transcend the written words, Starr said. Especially since America has struggled with racist incidents recently. In May, bananas were found hanging from nooses at three locations on the American University campus. This followed racist social media messages and a banana thrown into a black student’s dorm in the past few years. Ibram Kendi greets fans at Politics and Prose after discussing his book. 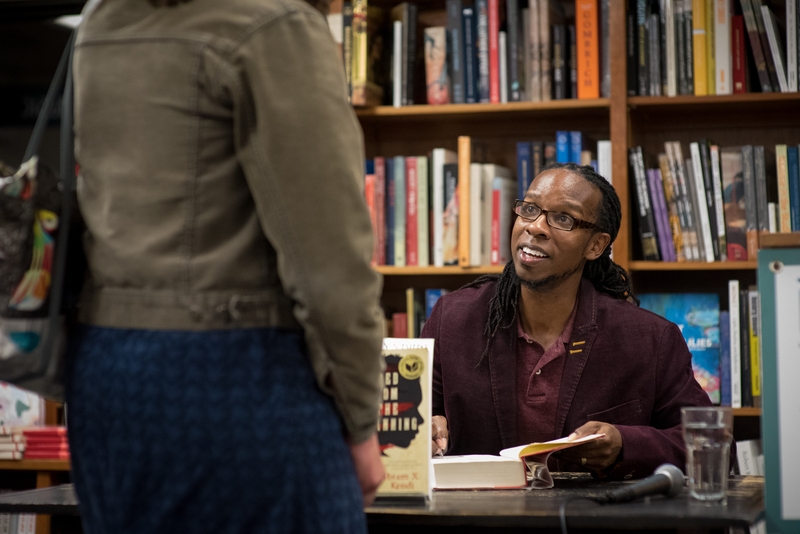 At the bookstore, the questions, and disquisitions posing as questions, continue as the crowd grapples with, or pushes back against, Kendi’s ideas about race and America. “I think that the issue is that the Africans and the Europeans really can’t mix,” one person steps to the mic to say. Finally, the talk is over and people form a line that stretches toward the door to have him sign their books. “If we are all mindful about this and put our hearts and souls into it, we can turn this ship around,” says James Kilgore, whose wife is in the line. He’s says he’s waiting to see what Kendi is going to do.